Homeowners who find themselves putting on socks before walking on their chilly bathroom floors no longer need to do this. When you combine a subfloor with radiant heating, the result is a toasty, climate-controlled radiant heated floor. Subfloor heating systems can be an advantage to anyone remodeling a bathroom or kitchen who expects that the flooring will be colder than desired. Subfloor heating raises floor covering temperatures to far more comfortable levels. Most interior floor systems are layered. The layer that you see and walk on is called the floor covering, aptly named because it is not the structural floor but a cover that can be removed and replaced, if necessary. A few floor covering examples: solid hardwood, engineered wood flooring, laminate, tile, and vinyl. Below the floor covering is a subfloor, itself attached directly to the floor joists. Subflooring, such as OSB or 5/8-inch plywood, provides a solid and steady base for the floor covering. 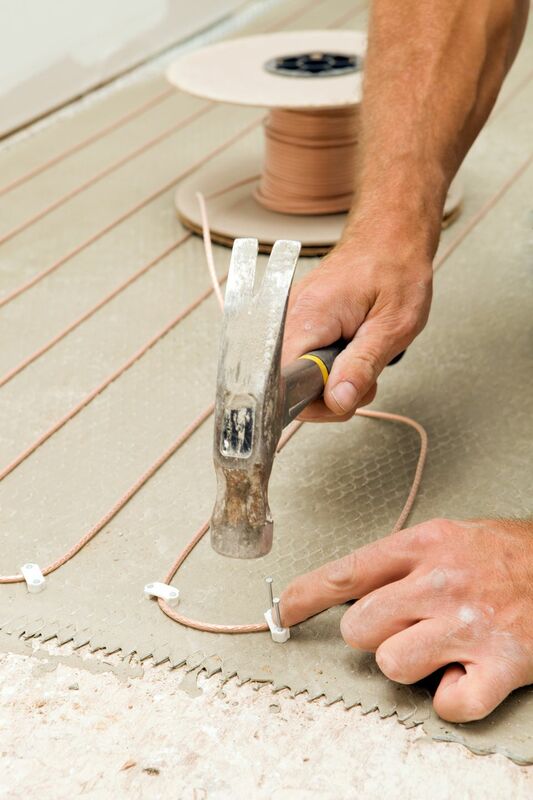 Subfloor heating systems rest between the subfloor and the floor covering. Flooring layers that lay above the radiant coils and the subfloor benefit from the simple fact that heat rises. As might be expected, direct or close contact heating always transmits the most heat. So, while embedded subfloor heating does mean reduced heat, the advantage is that the heat has more space to dissipate. If not for this dissipation, the pattern of heating coils would mean that the floor would be warm in some spots, cold in other spots. Dissipation equalizes the heat across the floor. Subfloor heating systems are not intended to be a home's primary heating source. However, homeowners in temperate climates may be able to use radiant floor systems to heat a room or even the entire house. The chief benefit of radiant floor systems is that they make floor coverings more comfortable to walk on. Controlled by a wall-mounted thermostat similar to an HVAC thermostat, electric coil systems are composed of long, continuous low-power electric cables embedded into the area below the floor covering. Electric coil systems often come in the form of panels with the coils pre-installed. Electric coils can be purchased separately and installed individually on the subfloor or embedded in concrete. Coils embedded in concrete or mortar take advantage of thermal mass to retain heat long after the coils have shut off. Some homeowners with embedded-coil systems run their system during off-peak electricity hours, gaining the advantage of lower prices for power. Hydronic radiant heating subfloor, also controlled by a thermostat, uses thin PEX heating tubes filled with hot water instead of electric wires. Heated water continually runs through the PEX tubes and radiates heat. Thicker 1 1/8-inch plywood is necessary to accommodate the channels through which the PEX tubes run. Channels are cut into the plywood just deep enough so that the tubes are flush with the top and ride as high as possible. Pre-cut in a factory, these channels ensure that the tubing is spread out across the floor in a balanced manner. Aluminum skin conforms to the top of plywood and channels, and energy from radiant panels is reflected room-ward by the aluminum sheathing. One subfloor heating option is to place larger diameter PEX hydronic tubes below both the floor covering and the subfloor. Access to the entire flooring system, such as in a basement or crawlspace, is required. Thick 1/2-inch PEX pipe of the same diameter used for plumbing is connected to a central manifold. Holes are bored into the joists at intervals to allow the tubing to pass between the joists. Between-joists hydronic systems are capable of heating the entire floor of a house, while electric coil system and other hydronic systems only heat one room at a time. Fiberglass insulation is fitted below the hydronic tubes in order to concentrate heat toward the floor above. Subfloor heating allows for the installation of floor coverings such as tile and stone that tend to be colder to the touch. Floor heating uses less energy than heating an entire room. Subfloor heating allows for localized heating; that is, heat is directed at specific parts of the home rather than the entire home. Subfloor heating encourages extra energy use when other avenues for mitigating cold flooring should instead be explored. Failed coils or tubes are difficult to remove since they are sometimes embedded in concrete or mortar that must be broken up. Retrofitting flooring that is in good condition can be difficult since it must be removed. On some systems, the floor installer needs to zealously avoid hitting the tubing or coils with the flooring nails or staples.